Three brothers, all on active service during the First World War, wrote to their teenage sister from their scattered positions. Each letter was relentlessly cheerful. A few of the letters sent to fifteen-year-old Chistabel in Rhodesia by her brothers – Harry, Lancelot and Charlie – have been passed on to me. The letter below is from Lancelot, the second eldest of the brothers, who had turned 21 in March 1915 and been promoted to Lieutenant a few days before the letter was posted. At the time the letter was written he was serving in France with D Squadron of the North Irish Horse. The letter is dated “18 or 19 July”. It arrived in Salisbury a month later – 18 August 1915. Heaps of thanks for very lengthy epistle (& most welcome one)! Great letter in fact!! Uncle Duncan would also add ‘so to speak, as it were etc!’ Well no Hun in sight yet thank goodness. We haven’t even shot into the air in the hopes that one was hiding there! However he has condescended to shoot near us! Terrible! He hasn’t even shot or gassed any one of us! The whole squadron are here still! They are now using us for digging parties every day or night. Beastly dull. We’ve only been shelled 3 times since we started and they were about 100 or 200 yds away and perfectly harmless. The great difficulty was to prevent men running out to pick up bits of shell. If I could draw I would send you a drawing of my best horse. He really is a good horse and has evidently raced as you must ride him to his bit all the time. His name is Joseph IV. I call him after a horse of Roughead’s (Joseph 3rd) which is a racer of his he keeps down at Leamington in Warwickshire (1) I have drawn him and put him in. It is to scale! Well the tea is getting cold so I’ll stop now. I simply love your letters so do send some more. If you like send me a skin tobacco pouch. Mine has been lost. Lancelot became ill with diptheria in February 1916 and was granted sick leave until August to recover from the diptheria and the stresses of over a year in France. He then applied to join the Indian Army, was accepted and had travelled out to join his new regiment, 3rd (Skinner’s) Horse, but became ill again. He died on 2 May 1917 and is buried in Rawalpindi War Cemetery. This link has a photograph of Lancelot and his gravestone. 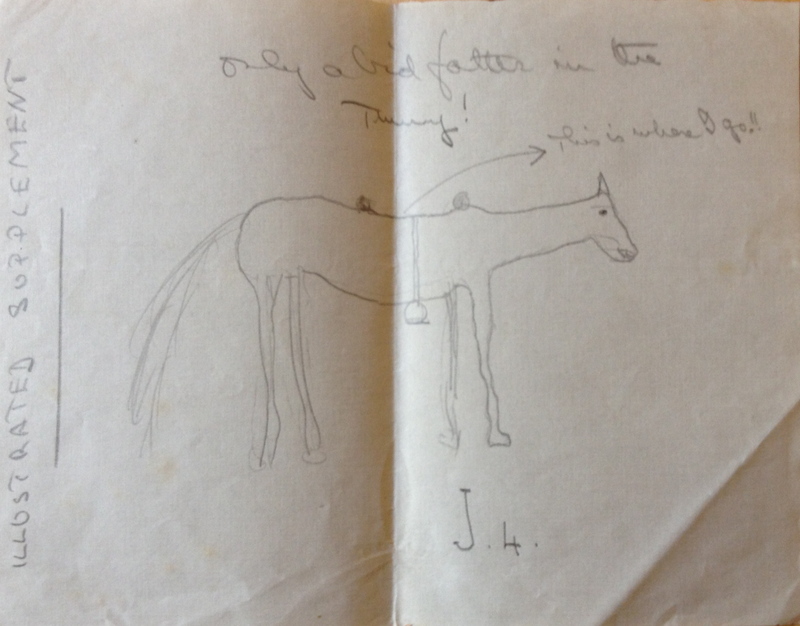 Here is some detail about the horses in the British Army during the First World War. It seems that despite appalling conditions the horses were taken care of far better than during many other military conflicts. Some of the information that follows has been taken from John Singleton’s paper written in May 1993 and entitled: Britain’s military use of horses 1914-1918. At the start of the First World War the British Army had 25,000 horses – by mid-1917 it had over half a million. Between 1914 – 1918 between five hundred to a thousand horses were shipped to Europe from North America every 1.5 days. Taking the War as a whole each year 15% of the animals employed by the British Army on the Western Front were killed. In peace time the Army expected to lose 10% of its animals. 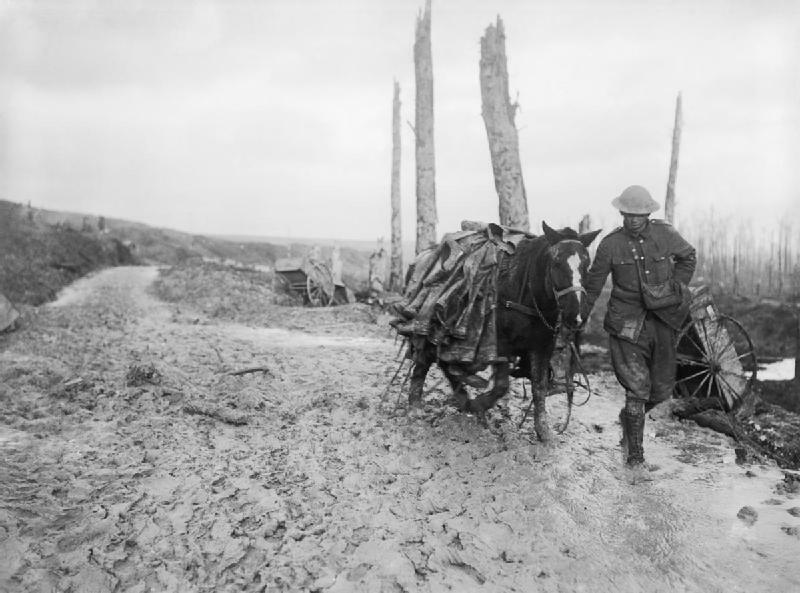 Most deaths of horses on the Western Front were caused by exhaustion, and mud-borne and respiratory diseases. A third of the horses on the Western Front were provided with rough masks effective against chlorine but not mustard gas. In 1918 approximately 14,000 British horses were killed in the German spring offensive. A further 22,500 were killed in the decisive allied attacks of summer and autumn. I don’t know what happened to Lancelot’s Joseph IV. This entry was posted in First World War, The UK, Zimbabwe and tagged First World War, horses, Lancelot Wise, North Irish Horse, Rawalpindi War Cemetery, Rhodesia, Western Front. Bookmark the permalink. Thanks! So pleased to have your company.